So what does the “springing the trap” image actually show? 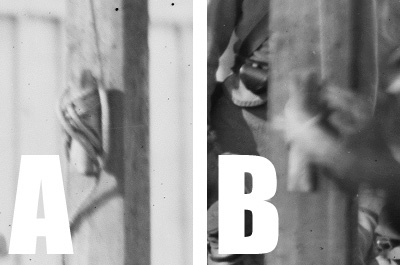 In “reading the death warrant” (A), there are multiple turns on the cleat, to secure the rope for the hanging. In “springing the trap” (B), most of those turns have been taken off the cleat, allowing the rope to be slacked to lower Wirz’ body through the trap. 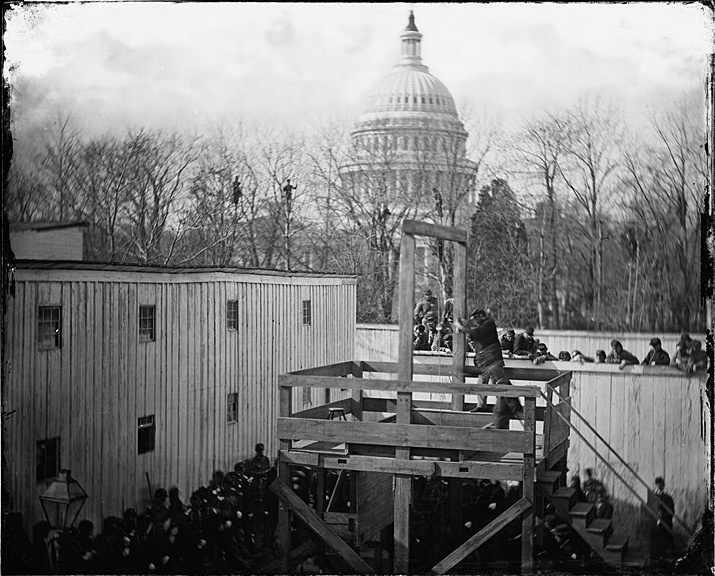 In the “body” image (A), Wirz’ head and shoulders are visible through the trap, and the hem of his outer clothing – described as a “black gown” in contemporary reports — and light-colored shoes are visible below the scaffold. 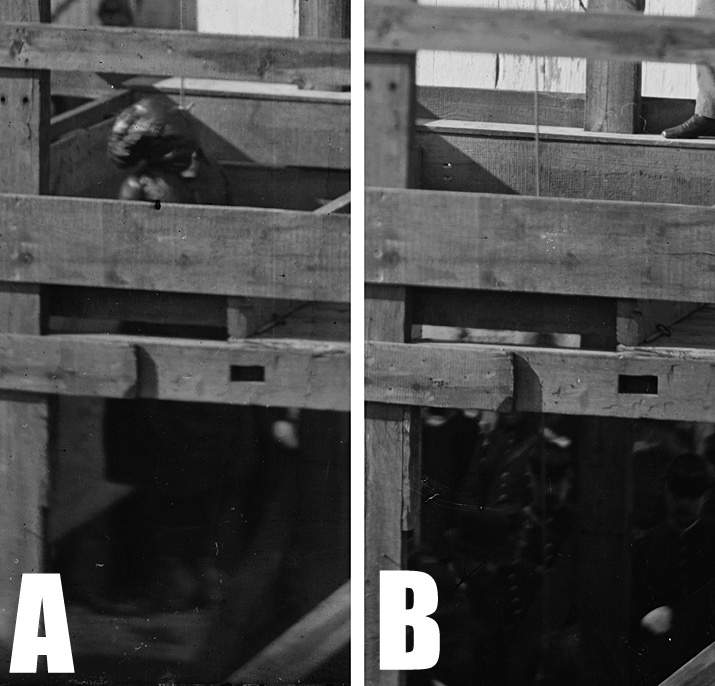 In the same part of the “springing” image (B), supposedly taken just moments after the drop, Wirz is not visible at all. Here we can see clearly the rope, Wirz’ hooded head and shoulders, and men gathered around the body was it’s being lowered from above. The rope itself has little or no slack, and the noose is still in place. At least three men stand by under the scaffold, at left, to handle the body. 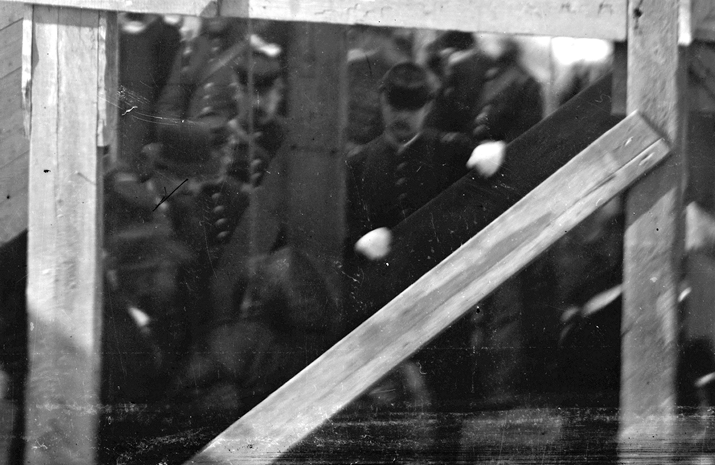 A white-gloved officer, likely from one of the two Pennsylvania regiments drawn up to witness the execution, stands by with his hands on the scaffold’s diagonal brace. The body was allowed to hang fifteen minutes, when it was lowered and placed on a stretcher, and carried to the hospital, where it was examined by Dr. C. M. Ford, surgeon of the prison, Dr. Ensign, 18th V.R., and Drs. Notson and Bliss, who found that his neck had been broken. His body was placed in a coffin furnished by the Government, and delivered to Rev. Father Boyle, who received from the prisoner his dying requests as to the disposition of his remains. Wirz was buried in the Mount Olivet Cemetery in Washington. Based on the Annapolis Gazette account, in fact, we can know the time of the so-called “springing” image, because the paper notes that the drop was made “at exactly 10.30 o’clock.” The “springing” photo, then, must have been taken at 10:45, fifteen minutes later, and is actually the last image in the sequence, not the third. 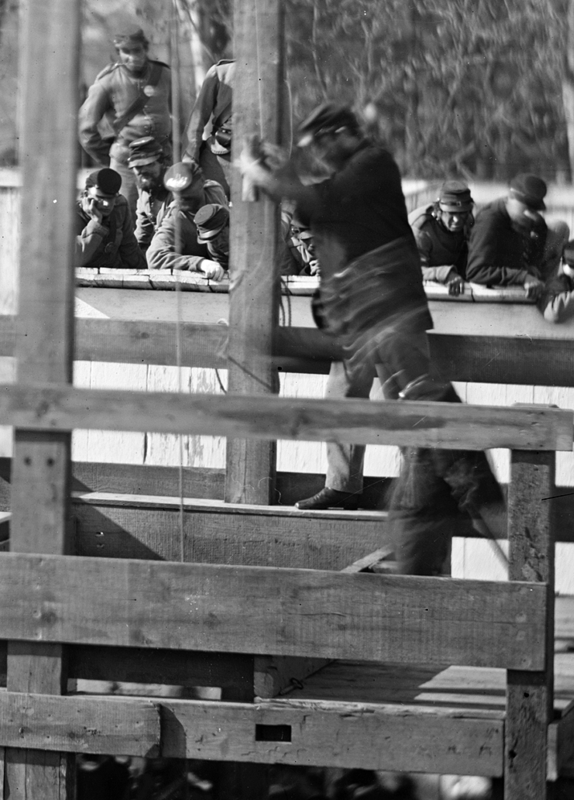 Closeup of the first image in the sequence,”reading the death warrant to Wirz on the scaffold.” Wirz himself is almost completely obscured in this image, sitting on a stool with only part of his right shoe visible, right center. 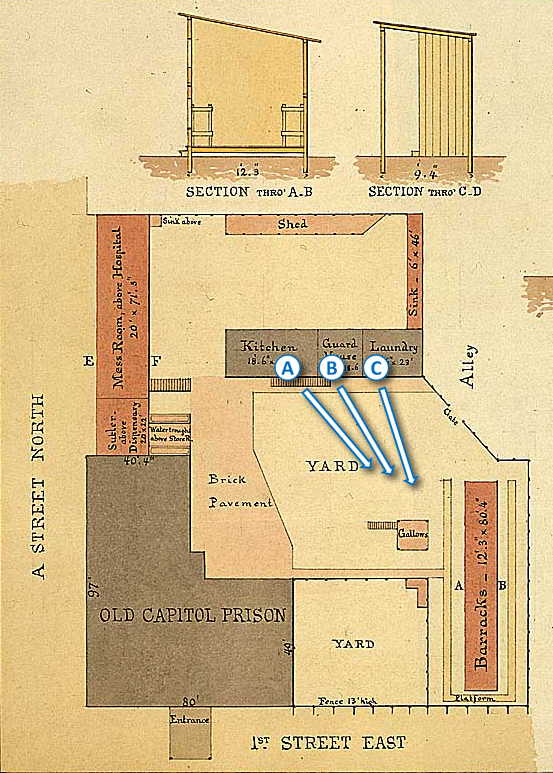 The Annapolis Gazette of November 16, 1865 identifies most of those present on the scaffold. As Major G. B. Russell, Provost Marshal of the District of Columbia, reads the death warrant, Wirz’ spiritual advisers, Rev. Frs. Boyle and Wiggett (or Wiget), minister to the condemned man. At left, Captain G. R. Walbridge, in command of the Old Capitol Prison, confers with a taller man in civilian clothes, presumably Sylvester Ballou, a military detective assigned to act as Wirz’ executioner. The bareheaded man at right is not mentioned in the account. The guards are part of the Veteran Reserve Corps, assigned to the Old Capitol Prison. 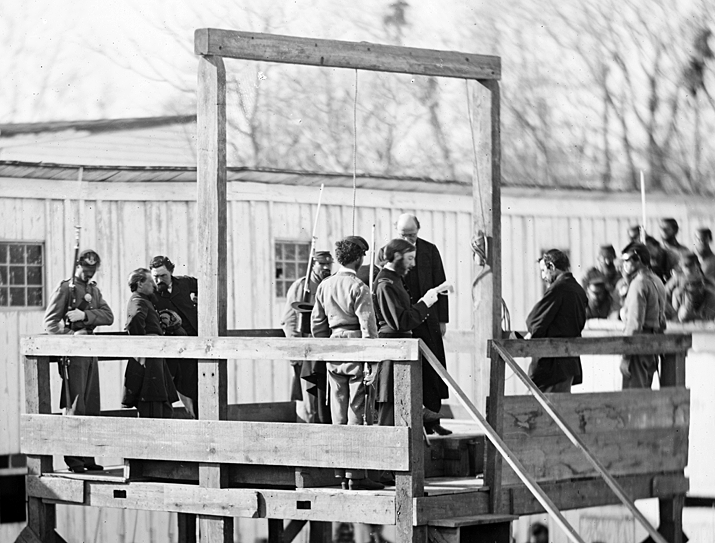 The time is about 10:20 a.m.
Closeup of the second image in the sequence, “adjusting the rope for the execution of Wirz.” Major Russell stands with his back to the Gardiner’s camera at right; the man in civilian clothes, believed to be executioner Sylvester Ballou, adjusts the noose around Wirz’ neck. This is the only image of the four with a clear view of Wirz himself. The time is about 10:28 a.m. 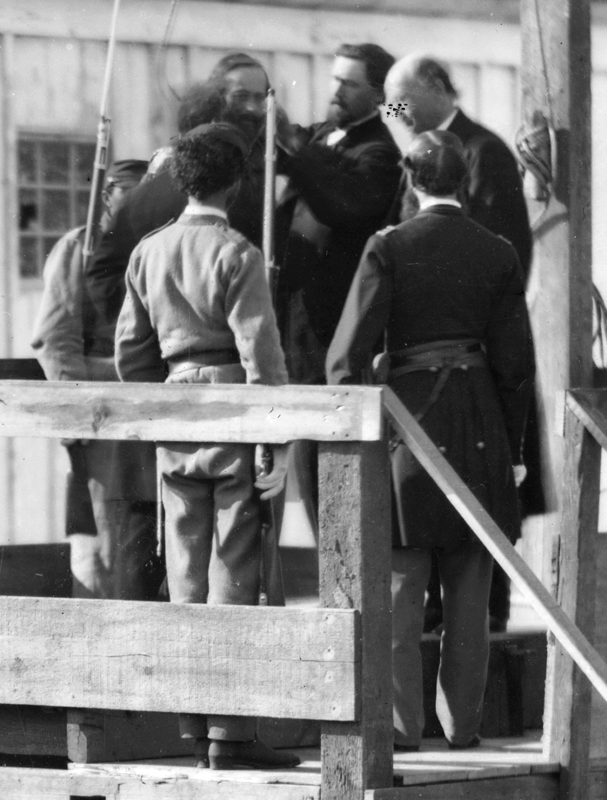 Lowering Wirz’ corpse to the ground, in the image originally captioned “springing the trap.” As a Federal soldier eases off the hangman’s rope on the cleat, an officer — probably Provost Marshal Russell — leans forward to grasp the rope. At the edge of the trap nearest the camera (in shadow), one of the pins used to render the trap safe until the time of execution. The time is about 10:45 a.m., November 10, 1865. Excellent post and analysis of the photos. It certainly does appear that the “Springing the Trap” photograph shows Wirz’s body being lowered to the ground, and should be considered the 4th image in the series. Great pictures and detective work worthy of NCIS. The older brother of my mother’s great grandfather was one of the first five hundred of the more than 11,000 Union prisoners who died at Andersonville, aka Camp Sumter. He was one of eight soldiers from the 80th Ohio captured in November, 1863, at Missionary Ridge and transferred to Andersonville early in 1864. He died in April while the perimeter walls for the camp were still under construction. Five of the remaining seven soldiers from that unit survived the ordeal. One of those five died when the boiler exploded on the overloaded Sultana in April, 1865, after he had been officially repatriated. 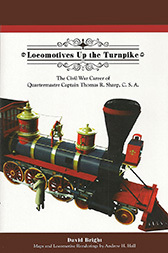 I’ve recently read Andersonville: The Last Depot by William Marvel. He tries to present a balanced picture in his narrative and doesn’t argue for or against the trial of Henry Wirz as a monumental injustice. He simply tells what he knows of the facts. The vast majority of German immigrants, even in the southern states, sided with the Union cause. 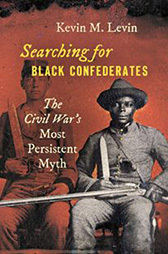 Putting a German immigrant in charge of the Confederacy’s largest POW camp was most likely an effort on the part of the Confederacy to demonstrate humanitarian concern for the welfare of the incarcerated Union soldiers. When Atlanta, population 12,000, fell to Sherman more than 30,000 Union soldiers were imprisoned at Andersonville. 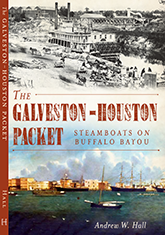 The prison’s population was smaller than New Orleans, Savannah and Richmond, and roughly the same as Charleston and Mobile, though women far outnumbered men in those cities. My father’s great grandfather served in a regiment that participated in the siege of Vicksburg during its first year in service. The unit consisted of a little more than 800 men originally and another 300 were recruited in 1864 and 1865 to replace the more than 200 soldiers who died of disease in the six months following Vicksburg. Troop strength when the unit left Camp Sigel in Milwaukee in March, 1863, was reduced from over 800 to less than 400 by the end of 1863. 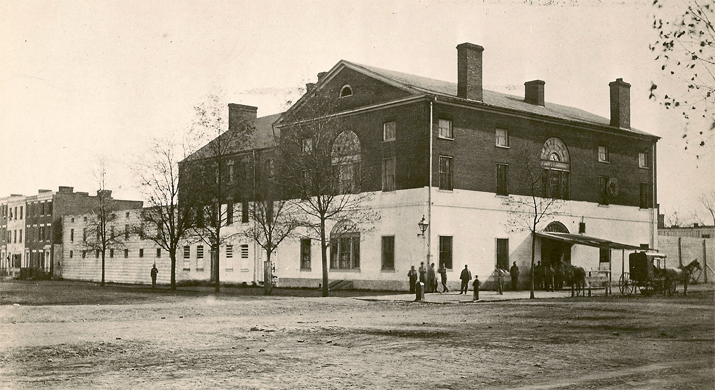 A number of the soldiers sent to hospitals or on furlough with illness recovered, some sufficiently to eventually rejoin their unit. One of them wrote a memoir in German. He described waking up in Memphis on a pile of corpses, stacked like cordwood, outside the door to the infirmary. 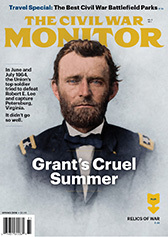 If you look at the numbers, the mortality rate for incarceration at Andersonville wasn’t appreciably different than that experienced by Union regiments in service at Vicksburg. Mortality from disease was no doubt far higher for the Confederates defending that city. Henry Wirz was guilty of serving the Confederacy and because he was German he made a convenient scapegoat. He’s an important figure because his case prefigures Nuremberg and the whole concept of war crimes. I believe you mean Gardner photographed the executions of both Wirz and the Lincoln conspirators. Andy, I know this is 3 years later, but I wonder if you saw the caption in the photo called “Interior of Wirz’s room just as he left it” in the Huntington Collection that TF linked to. If you enlarge it, written just below the photo that’s called the “Springing the Trap” are the words “Lowering Wirz …?” Exactly what you said. I love perusing this blog. Thanks!